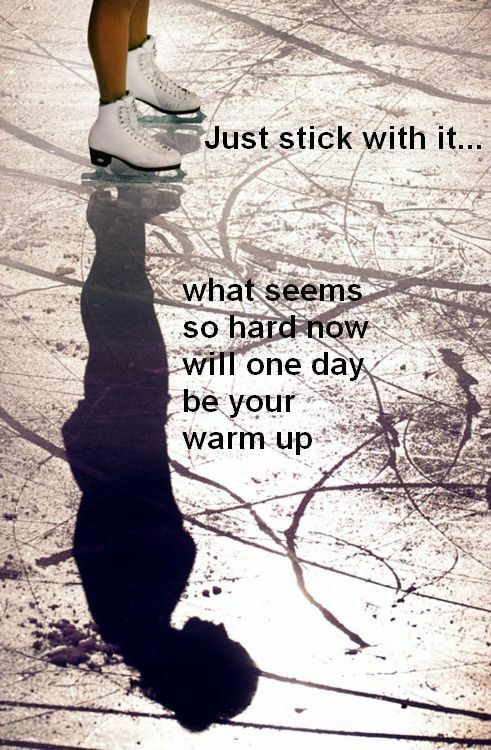 I just had my skates sharpened after…gulp… A YEAR! Yes, it’s true. I waited a whole friggen year to sharpen them. I’ve been averaging at least 6 hours of skating time a week if not more for the past few 10 months. I’ve been noticing some serious skidding on simple edges for the past month and knew I couldn’t put it off any longer. I actually like having my skates sharpened but as the trip is about an hour and a half to the skate sharpener and I usually have to plan about 2 weeks in advance for the appointment, I tend to put it off. This time I really dropped the ball and pushed it way back. I really wish now I hadn’t. I take my silver test in exactly 3 1/2 weeks and this morning I spent a lot of time just figuring out how to stop. HA. I’m serious. My blades must have been so dull that now it’s like the blades are extremely sharp. I told Mike (skate sharpener) that I was taking a moves test and he even took the sharpening down a notch. Right now, it’s like I’m skating on completely new blades. T-stop? Non-existent. Back stop? Please. There had better not be anyone right behind me because I will plow right through them. I’m afraid to put the brakes on completely because these things stop completely so I end up skidding a bit. Did I mention that I broke my leg years ago on a front T-stop going too fast? Oh, yes, dragged my leg all the way around and snapped my Tibia. Hence, the freak out on stopping. I’m trying to laugh and not panic right now. The good news is that things that seemed to take so much energy now take nothing at all. The edge just works. My cross strokes, crossovers, camel spins and spirals all benefited. Before, I was wondering what was wrong with me that I could not hold my spiral edges without a lot of effort whereas months ago it was never even an issue. Now, I know why. DUH. Also this morning, while hesitant, I was pleasantly surprised by how easy it was to just gently rock from side to side in the power pulls. Same thing with the back cross strokes, so easy. Nothing takes as much effort including the three turns. However, now I have to adjust my rhythm, push and timing on the three turns. I am way off on on both three turn patterns. I worked really hard to at least feeling somewhat comfortable going in and out of them, not perfect, but at least somewhat controlled. Now, it’s hit or miss again. I’m rocking way up to my toe to turn my back inside three turns, I think leaning too much. I was doing that a little bit anyway and now it is exaggerated and scary to be rocking towards the toe and almost tripping. It’s so frustrating because I know that means I really didn’t have these moves under control anyway if sharpening my blades caused the turns to be as bad as they were this morning. So, back to the drawing board I go. I’m not sure if this is going to be under control by the test but I’m going to have to work extremely hard to get everything back to where they were and then some. Oh yeah, and to be able to stop. Especially on the 8 step sequence. I’m like a freight train that gets up to full speed and then can’t stop…everyone on the ice around me should be running for their lives… or skating! So we will see how things go in the next three weeks. 1. Look where you are going on the Fwd 3 turn. Always. Not down and not straight ahead (that is not where you are going) this will place the turn in the middle of the pattern automatically. 2. On the back 3 you should always have your head turned to look over your shoulder, Free arm firmly back. 2. Bend the knee when coming in and out of the 3 turns greatly. 3. Keep the free leg close on both fwd and back 3 turns.